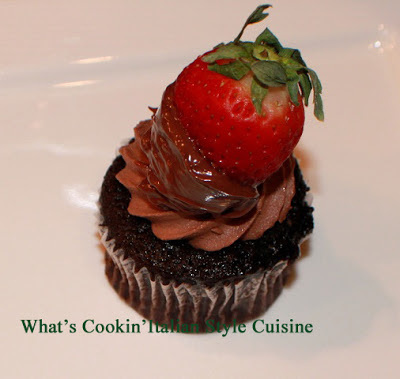 Dipped Strawberries in Nutella with a Nutella chocolate cupcake and Nutella Frosting. Hard to resist this perfect easy treat for your Valentine and the special night needs a great ending! For all those lovers out there that don't want to cook..
Have a Romantic evening! It doesn't have to be Valentines Day! Prepare cupcake tins with liners and preheat oven to 350 degrees. In a large mixing bowl add the sugar and butter to cream. Beat in eggs one at a time. Add the vanilla, Nutella and blend together. Gradually add the flour a little at a time with the baking powder, salt and beat until smooth. Pour into liners and bake at 350 for 25 minutes or until the middles spring back. Cool completely. Dip bottoms of the strawberries and half way up just before placing on the top of cupcake. What a pretty looking cupcake! Made these for family and friends for Valentine's. They are delicious! I love this frosting. Your recipes never disappoint. Thank you for doing what you do.